My wife and I go to Disneyland about every other month. We are annual passholders so we try to take advantage of going down to Anaheim as much as we possibly can. We’ve had our annual passes for about three years and have mostly eaten at the majority of the restaurants in California Adventure and Disneyland Park. On this last trip we decided to try a few of the places in Downtown Disney. One Friday we woke up and spontaneously decided let’s go to Disney for the weekend. After we got off work we hopped in the car and drove straight there. It was mid afternoon so the first thing after the long drive was a bite to eat. We gave the Catal UVA Bar a try. We had previously been there a few years for drinks but never had a chance to have a meal there. It was perfect timing as it was something new and we were hungry. Catal UVA bar comes across first as a bar since that’s the first thing you see. It’s a circular shaped bar with outdoor seating all around it right in the middle of the Downtown Disney’s walkway to the theme parks. Don’t be fooled by the moderately stocked bar area. It actually has some pretty good food as well! Since we didn’t want to stuff ourselves, Marcy and I ended up splitting our meal. We often do this as the serving sizes are often way to big for any one person to eat and we didn’t want to feel miserable the rest of the day while walking around the parks because we ate too much. 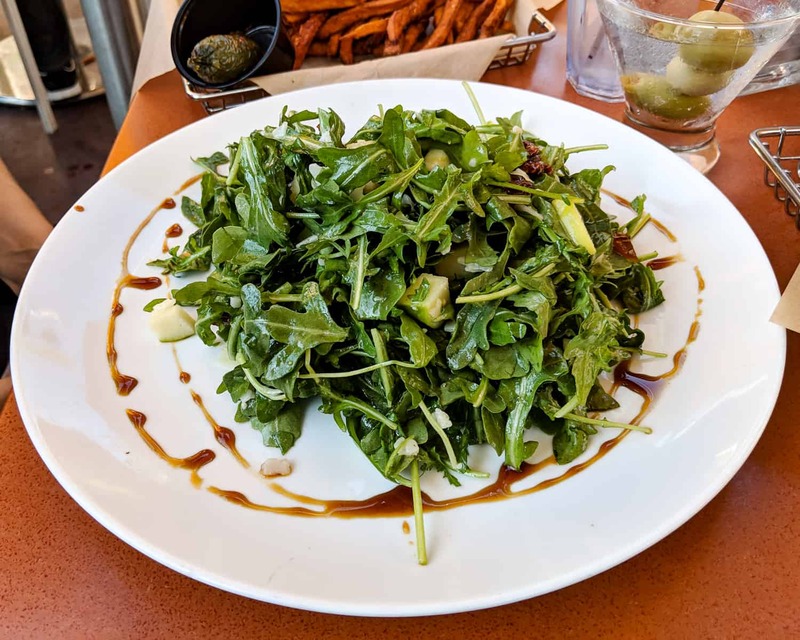 We ordered the Manchego Salad which consisted of Wild Arugula, Manchego Cheese, Shallots, Apples, Dates, Candied Walnuts, and Toasted Walnut Vinaigrette dressing. The salad was good and refreshing for a warm summer day. The temperature was in the low 90’s so there’s nothing like a summer salad to make you feel cool. My only gripe about the salad was the candied walnuts. For me it added too much sweetness to the salad. There were already apples as well as the dates and balsamic drizzle which was more than enough sugar for me. We also ordered and split the Durango Burger which had Certified Angus Beef, Charred Guajillo Aïoli, Pepper Jack Cheese, Chorizo Bilbao, Lettuce, Red Onions, Guacamole, and Telera Roll topped with a Jalapeño Pepper. 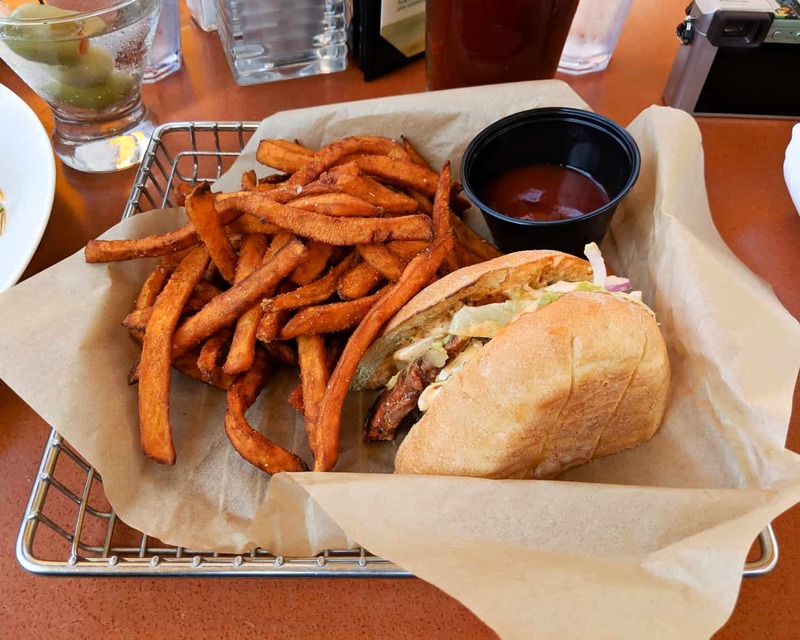 While we had the salad to cool things down we had the burger to heat things back up! This is one of the better restaurant burgers I’ve had in a while. I’m normally not too big on eating burgers out as I make better ones at home, but this one was actually pretty good! For our first eating experience, the Catal UVA Bar wasn’t bad at all and we would actually go back. In fact, we did go back that evening for dessert! I will say that many of the restaurants in downtown Disney can be a little pricey but if you like good food the Catal UVA Bar shouldn’t disappoint at all.